Flowers and plants can add a great deal of life and color to your landscaping and even interior design. When the goal is to have plants inside, garden pots are often your only option, as free-standing soil indoors is not something that is seen very often. For outdoor planting, it is sometimes best to place your plants into garden pots first to allow them to grow and establish strong roots before transplanting them into the earth. Or perhaps the season has not yet arrived for a particular plant so it can first be cultivated in a garden pot indoors. 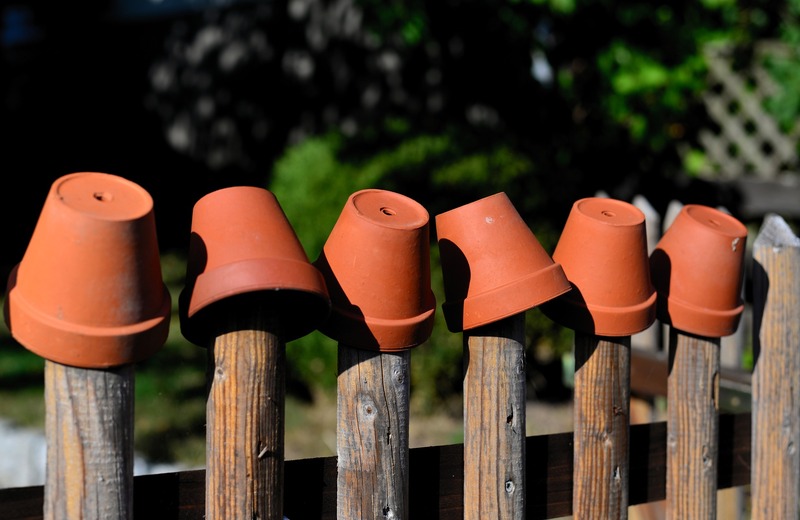 In this article, we'll explore the uses of garden pots, and 10 options on the market. Before we consider the 10 garden pots below that we can choose from on the market when looking for a home for our plants or flowers, we'll consider a few frequently asked questions concerning garden pots so we have a thorough understanding of what they are before we assess the various models and brands that are available to us. Garden pots are containers into which soil is placed. A garden pot may be in the shape of a large cup or bowl as is often the case. 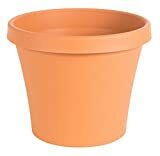 However, a garden pot can really take on any form insofar as it performs the function of holding the soil that is needed to plant your plants and flowers and to subsequently feed them water and nutrients. A garden pot could be an old soda can with the top cut off, or a piggy bank filled with soil, or even simply a bowl filled with soil. What we must consider when choosing a garden pot is how they work and what the plants we are placing into them require. What Do Garden Pots Do? Garden pots provide a receptacle into which soil can be placed, and then your plants can be planted into the soil. The key purpose of the garden pot is to create a self-contained environment for your plants in which you can control the amount of water and nutrients that are fed to the plant. Some plants have specific requirements in terms of the type of soil, how often they are watered, and the nutrients that are needed in the soil. Garden pots allow us to customize the environment of each individual plant by keeping the soil in the distinct environment of the garden pot itself. How Do Garden Pots Work? Garden pots at their most basic hold soil, have walls capable of keeping roots in and generally have drainage holes to allow for excess water to escape to preclude the drowning of plants and/or development of mold and mildew. Having effective drainage holes allows for excess water to escape to prevent plant drowning and also allows oxygen in to further nurture your plants and their roots. The use of porous materials is suggested to allow for the passage of air and moisture through the garden pot's walls. When the pots are porous, the air is allowed to circulate around plant roots, strengthening them. Effectively designed garden pots have drainage holes and are porous to encourage the flow of air around roots and to discourage the collection of excess water around them. 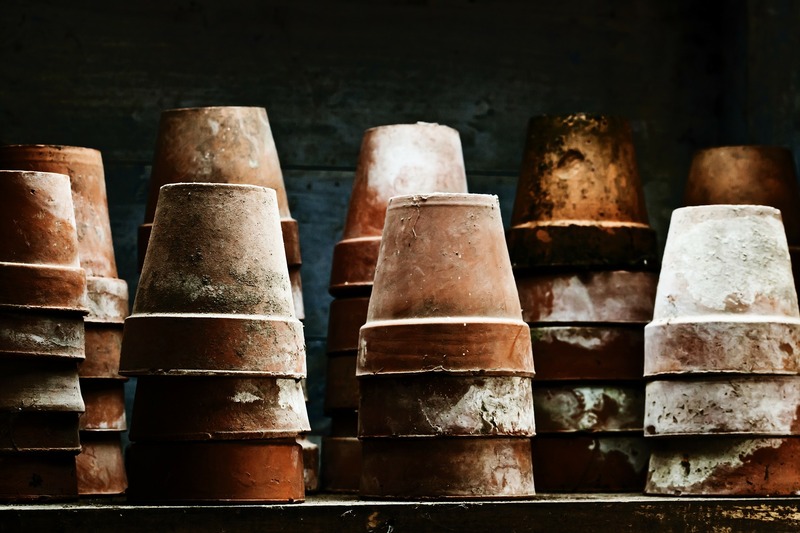 The porous nature of garden pots also allows for moisture to evaporate out the side of the pot, cooling the soil, drawing out excess water, and preventing rot. When containers are more porous though, they dry out the soil faster, and so the plants in such garden pots must be watered more often. The weight of the garden pot determines how well it stays in place or how difficult it is to move, so consider where it will be set and any weight constraints. 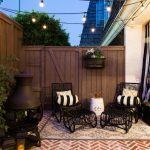 Where Can You Buy Garden Pots? Garden pots are available at a wide variety of retail locations ranging from specialty garden stores to dollar stores. 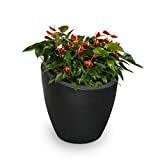 If you're on the market for a cheap plastic garden pot, then a dollar store, Home Depot, Wal Mart, and other such locations will have a wide variety of options from which to choose. For more specialized garden pots made of rarer materials and with additional functions and features, specialty garden stores are an option, as is Amazon. For the 10 products explored below, we've used Amazon to identify them, which allows you to shop from the convenience of home. What Are Key Factors to Consider When Buying a Garden Pot? When purchasing a garden pot, it is important to take into account the key functions of the garden pot and to then match it up with the requirements of the plants and flowers you intend upon putting into it. When choosing a garden pot, the three most important features to focus upon are drainage, porosity, and weight, as discussed above. 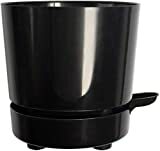 In the following section, we reviewed garden pots in accordance with their key features, and their pros and cons, after which we considered the approximate price of the given product. The key features we assessed were appearance and function, with the pros and cons considering various characteristics of each garden pot we've reviewed. The cost of garden pots is generally in the $10-$30 range, although cheaper ingredients such as disposable plastic may drastically drop that cost, while rare materials ranging from quartz to crystal and beyond can increase the cost of our garden pots to as much as we'd like to spend. While solid diamond garden pots are not advisable, they are nevertheless not impossible. The level of cost depends entirely upon what material you prefer, and how much you are willing to spend to get it. The Whiskey Barrel Planter is a uniquely designed planter manufactured to look like a traditional whiskey barrel. 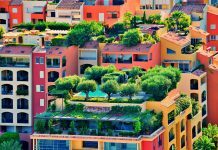 It is constructed from high-density resin and is designed with drainage holes for outdoor use. 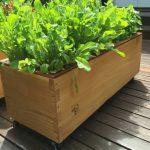 Designed to work both indoors and outdoors, the HBServices self-watering and aerating planter pot is useful in that it prevents mold, root rot, and soil fungus. 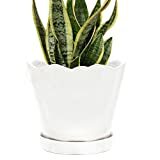 It is well-suited for herbs and succulents and is useful for windowsill gardens both indoor and outdoor. Within the planter, hollow legs reach into the reservoir from above, which allows the soil to draw moisture itself upwards into the roots, preventing them from being drowned through being surrounded by water. The design is highly intelligent and makes it so that you don't have to worry as much about over-watering as this drains the excess water right out. Suncast P222105B92 Sonora Planter, 22"
A pleasant basket-weave aesthetic makes this planter look somewhat like an old-school straw basket, but it is made out of durable resin. 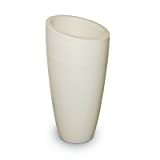 To add to the durability of the planter, the Suncast Sonora Resin Planter is blow-molded. It is designed for indoor and outdoor use and comes with a drillable drain hole, giving you the choice of whether to open the bottom to leakage or not. 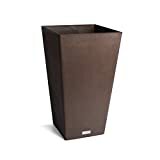 It is water and warp resistant and is even rot resistant, making this one of the largest and most durable garden pots reviewed in this article. The Bloem Fiskars TerraPot Planter is made of all-weather resin and is both durable and comes with UV protection. The texture is that of natural clay, and it has the traditional tapered shape with a rolled lip to increase the durability of the pot. 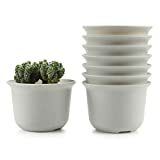 It is a tough and lightweight alternative to clay or ceramic planters and has an optional punch-out drainage hole to prevent over-watering if outdoors or to allow you to keep it leak-free inside depending on your preference. 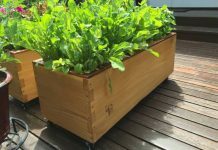 This is one of the largest and most costly planters that we reviewed. The quality of the Veradek Midland Series planter, however, is quite high. It is weather-resistant, treated with UV inhibitors to avoid fading. The drain hole and plug make it a viable garden pot candidate for inside your home or outside. It comes with an insert shelf if you don't need to fill the entire pot with soil to accommodate your preferred plant. It has a single wall molded design and is made from high-grade polyethylene composite. It is both impact-resistant and flexible and even frost-resistant for colder climates. Suitable coaster ASIN: B0762RKTT1. Light weight - Ideal for using as hanging planters. The T4U Round Succulent Plant Pot includes 8 pots for the price of one. They are made of hard thick resin plastic and are durable and hard to deform or break. They are ideal as hanging planters given their low weight. They are washable and reusable and can be highly valuable as seeding, cutting, and nursery pots. This particular planter is one of the most stylish ones explored in this article. It is made of galvanized bronze metal that matches with nearly any decor. 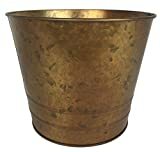 It is 6 inches high and so, while a bit small, it is nevertheless useful to plant some seedlings or smaller plants to get them started indoors in this highly stylish metal planter pail. A ceramic flower and plant container with a drainage hole and detachable saucer. Weatherproof and ultra tough, with UV inhibitors to protect your plants' roots and protect the planter from fading. Multiple bright colors also available beyond the ivory option. An abstract shaped curved planter with style. Of the planters explored that are available, the Veradek is the best large option, while the Mayne is the finest mid-size option. While they are more costly, they are style pieces in and of themselves and will last for many years. 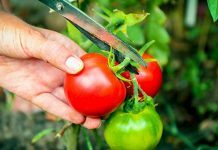 For more articles and information on how to better grow your garden, check back to Grow Wherever for ongoing articles and updates.